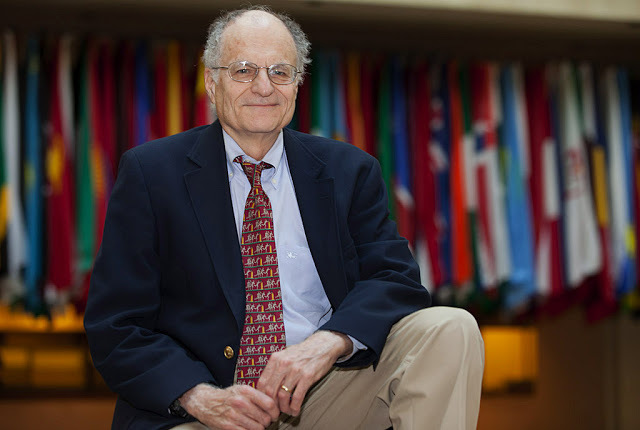 Thomas Sargent, winner of the 2011 Nobel Prize in Economic Science, has made several visits over the past year to the IMF’s Research Department. Last week, he talked to Prakash Loungani about problems ailing Europe and the United States—and what each could learn from the other’s history. Loungani: Europe’s fiscal challenges are foremost on minds here. This is something you have worked on in the past—the interplay of monetary and fiscal policy. Sargent: Yes. I think Europe can learn from the U.S history. In the 1780s, the U.S. consisted of 13 sovereign states and a weak center. The states could levy taxes, the federal government could not. Government debt, federal plus state, was 40 percent of GDP, very high for a poor country. It was a crisis. Creditors worried that they could not be repaid. Sargent: Well, in the end the outcome was that the U.S. founding fathers rewrote the constitution so that it gave better protection to creditors. The constitution reflected a grand bargain: the central government bailed out the states, and the states gave up the power to levy tariffs. Knowing that the federal government had the power to raise tax revenues gave creditors reassurance that their debts would be repaid. Loungani: You’re saying the present U.S. constitution was adopted to give better protection to creditors? Sargent: Yeah, makes me sound like a Marxist, doesn’t it? But it’s all there in our history. Alexander Hamilton was basically creating a fiscal union—bailing out the states in return for a transfer of tax-levying authority to the center. And the point of a fiscal union was to change the expectations of creditors about the chances of being repaid now and in the future. Note, by the way, that the U.S. had a fiscal union before it had a monetary union. Loungani: So what are the lessons for Europe today? Sargent: Don’t some aspects of the EU today remind you of the historical experience I’ve described? The member states have the power to tax, not the center. Many EU-wide fiscal actions require unanimous consent by member states. But reforms that could lead to a fiscal union are being proposed, as they were in the U.S. in the 1780s. I think at the very least the historical episode—not just the one I described but several others that I could—shows that many configurations of fiscal and monetary arrangements are possible, and some of these work to provide assurance to creditors that there will be enough tax revenues to service the debt. I offer this as hope, but I must say that I am not an expert on day-to-day European economics or on their politics. Loungani: You are an expert on the U.S., and particularly on unemployment, which you’ve also worked on over the years. What would you do about the high U.S. unemployment rate? Sargent: I would deal with the fundamental causes of financial crisis—the housing market particularly, where there are debts that haven’t been settled and people can’t yet see how they will be settled. And then to the extent that uncertainty about the course of government regulations is holding things back, I’d tackle that. Loungani: That could take time. How would you ease the pain of the unemployed in the meantime? Sargent: Some of the European countries, Germany and the U.K., have the right idea. They seem to do better on what’s called welfare-to-work programs—ways of helping the unemployed get into new jobs. We could have done more of that here in the U.S.
Loungani: We extended unemployment benefits many times. Were you in favor of that? Sargent: I worry that can be a trap—we could end up with persistently high unemployment. Sargent: You have to go back to the basic ideas in the work that I’ve done with colleagues over the years. Our work builds on the finding that after about 1980 something changed. 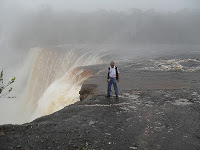 The [adverse] hits that people suffered to their incomes became more permanent in nature. In the jargon of our profession, the volatility in the permanent component of earnings increased; workers were more likely to suffer permanent shocks to their human capital. Tom Friedman’s The World is Flat has many examples of all this and the reasons why it happened. So we talk about the Great Moderation at the macro level but for individual workers it was just the opposite. Loungani: How does this lead to the trap? Sargent: Well, think about what can happen when workers suffer a permanent hit to their incomes, and you offer then the alternative of generous and long-lasting unemployment benefits. For older workers, particularly, the benefits become an attractive option relative to looking hard for another job, which is not going to pay as much because your human capital just took a hit. And getting retrained is hard. I mean I was just 30 when my human capital was hit. You know I went to Harvard, right? I actually got pretty good at playing around with the IS/LM model, which is what I learnt there. And then a new thing—rational expectations—came along and I had to learn all this math and it was hard. Well, if you’re in your 50s you’re not going to be eager to try out the hard things. You’ll try to get by with the unemployment benefits. You end up with lots of workers who are detached from the labor force. I think that’s what happened in Europe in the 1980s. They’d always had more a generous welfare system but the impact of that wasn’t felt until the nature of the shocks to incomes changed in the manner that I described. Loungani: Yes, the interaction of shocks and institutions. Olivier Blanchard once said when the shocks changed Europe became like someone wearing a winter jacket in the summertime—the labor market institutions curbed flexibility when it was needed. Sargent: Exactly. So I think the people who want to keep extending U.S. unemployment benefits have the right motives but we can end up in the wrong place—a world of persistent high unemployment. So, while in the case of fiscal institutions Europe could look to early U.S. history, in the case of labor market institutions, the U.S. should keep in mind the European experience of not so long ago. The World Economic Forum (best known for hosting this week’s Davos conference) plays host to a number of Global Agenda Councils which bring together experts in a particular field to produce reports summing up the best available wisdom on what to do next. There’s a GAC on Employment and Social Protection which has produced a report for Davos 2012 snappily titled “The Case for an Integrated Model of Growth, Employment and Social Protection“. But it makes some very pertinent recommendations for the global leaders gathered in Davos, and is part and parcel of the growing intellectual argument for growth and jobs to have a higher priority than debt and deficit reduction (see recent posts on ILO, IMF and OECD reports). The GAC on Employment and Social Protection includes people you would expect to make these arguments – like Vice-Chair TUAC General Secretary John Evans, ITUCGeneral Secretary Sharan Burrow and AFLCIO chief economist Ron Blackwell – as well as people who work in the global institutions already leaning this way like Stephen Pursey of the ILO and Prakash Loungani of the IMF. But it also includes academics like Zhang Xiulan from Beijing Normal University and Jose Antonio Ocampo from Columbia University in the US; and business representatives like Premkumar Seshadri of India’s HCL Technologies and Thero Setiloane from Business Leadership South Africa. So it’s a broad-based group. governments working on growth and social protection with other stakeholders such as unions, business and NGOs. Recent headlines suggest the ‘Made in the USA’ label is back in business. “Manufacturing employment has grown faster in the US than in any other leading developed economy since the start of the recovery,” says the FT. Indicators of the manufacturing sector also point to an optimistic outlook, according to January’s Business Outlook Survey of Philadelphia Fed. 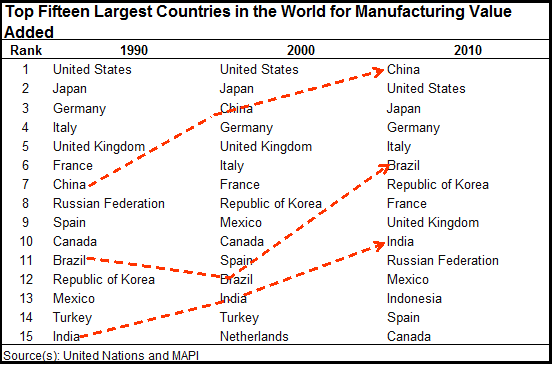 The manufacturing outlook seems good in the rest of the world too with the exception of Europe. World industrial production will grow 5% next year, compared to 4.5% in 2011, according to Dan Meckstroth (Chief Economist of Manufacturers Alliance for Productivity and Innovation—MAPI). But, beneath the surface things seem less hopeful, particularly in the advanced economies. For more than a decade, there has been a “hollowing out” of jobs in these economies — a striking loss of middle-income and manufacturing jobs – as summarized in a research piece I coauthored. 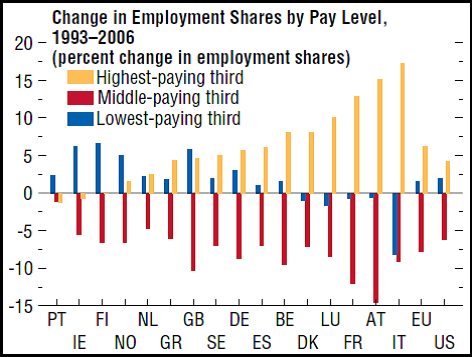 The chart below shows a striking decline in middle-income jobs in advanced economies between 1993 and 2006. Advanced economies are also losing market share in manufacturing to emerging economies. 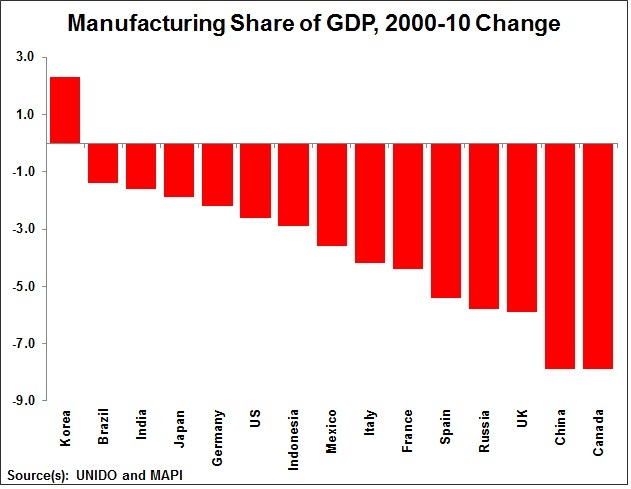 And in both advanced and emerging economies, manufacturing share’s of GDP is declining. My research notes that the decline in manufacturing jobs accelerated during the 2000s and was accompanied by a huge increase in advanced economies’ imports from low-income countries. Other authors estimate that at least one-third of the aggregate decline in U.S. manufacturing employment during 1990–2007 can be attributed to increased imports from emerging markets. 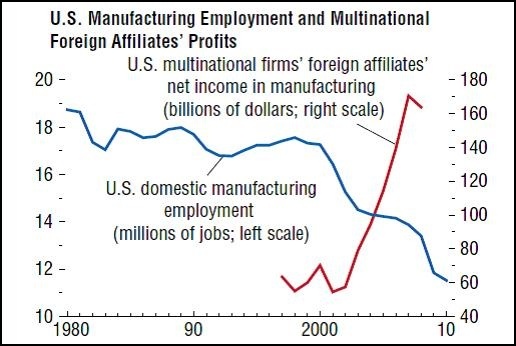 The chart below shows the sharp decline in U.S. manufacturing jobs and the increase in the profits of multinational firms during the 2000s. Meckstroth also points out that non financial corporate profits are nearly back to their peak, in particular, income for foreign affiliates which are extremely profitable. The manufacturing outlook seems good in the rest of the world too with the exception of Europe. The Brookings Institution was selected today as the “top think tank in the world” by an academic program that evaluated over 5,000 think tanks from across the globe. That’s the second year in a row that Brookings has topped the “Global Go To Think Tanks Rankings,” compiled by the Think Tank and Civil Societies program at the University of Pennsylvania and published by the Diplomatic Courier. The project considered the views of 793 experts, 150 journalists and scholars, 55 current and former directors of think tank programs, 40 public and private donors, hundreds of think tanks, 25-30 intergovernmental organizations, and 120 academic institutions. Other U.S.-based think tanks also fared well. The Carnegie Endowment for International Peace held its spot from last year, staying put at #3 on the list, while the Council on Foreign Relations (CFR) dropped two slots from last year, coming in at #4. 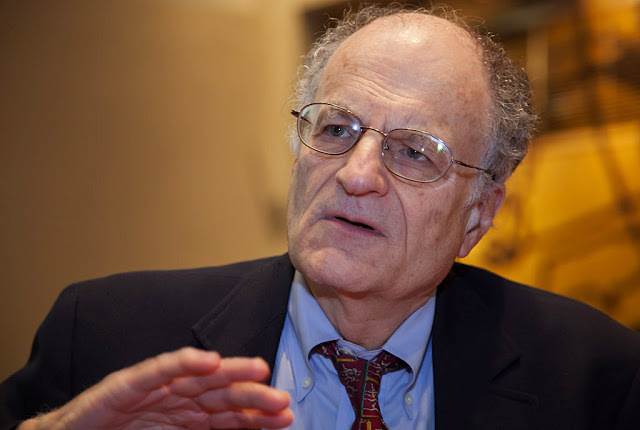 The Center for Strategic and International Studies (CSIS) jumped up two spots to #5, the RAND Corporation held its place at #6, and the Peterson Institute for International Economics kept its #10 position. Non-U.S. think tanks that made the top 10 were Chatham House (#2), Amnesty International (#7) , Transparency International (#8), and the International Crisis Group (#9). Conservative and libertarian think tanks took a hit in 2011: The Heritage Foundation dropped five places since last year, coming in this year at #13. CATO dropped from #12 last year to #14 this year, and the American Enterprise Institute dropped in the rankings from #13 to #17. Meanwhile, the liberal Center for American Progress made its first appearance on the top 25, coming in at #19. Human Rights Watch was ranked #22 in the world, down six spots compared to last year. Some U.S.-based think thanks were singled out as the best in specific regions or functions. 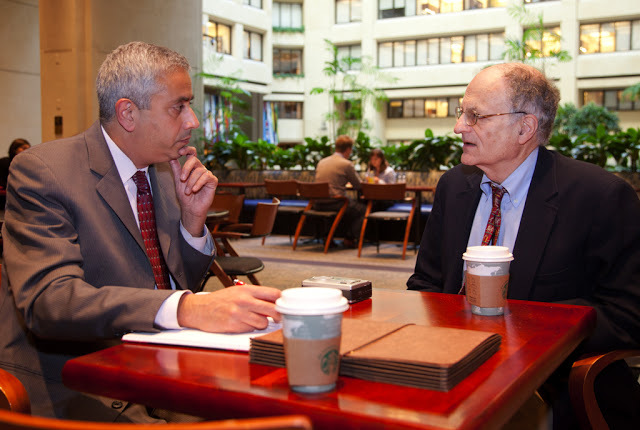 CSIS was ranked #1 in international affairs and security research. The Carnegie Moscow Center and the Carnegie Middle East Center were ranked as the top think tanks in their region. Brookings was ranked #1 in international development research, and the Carnegie Endowment was named as the think tank with the most innovative policy ideas. Google Ideas, the “think-do tank” led by former State Department official Jared Cohen, was named the best new think tank established in the last 18 months. CFR was named as the best think tank in the world in the use of digital and social media. 5,329 think tanks were nominated and then ranked overall and in 30 different regional and functional sub-categories. This year, the process was changed to include “expert panels” that evaluated the data, incorporate categories for smaller think tanks, and expand the participation of organizations in developing countries, especially in the BRICs (Brazil, Russia, India, and China). The United States by far has the most think tanks in the world (1,815! ), followed by China (425), India (292), Britain (286), and Germany (194). 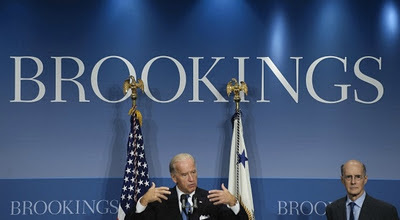 Washington alone has 393 think tanks. Other leading states include Massachusetts, with 176, and California with 170. The think tanks were rated by their access to resources, how much content they put out, and their impact on policy and politics. That’s the second year in a row that Brookings has topped the “Global Go To Think Tanks Rankings,” compiled by the Think Tank and Civil Societies program at the University of Pennsylvania and published by the Diplomatic Courier. In the 1910s, when delivering mail was a hazardous job, the post office was one of the few places where African-Americans could find work. The bulk of long-distance mail was delivered by rail; the railway cars where mail clerks worked were made of wood and were prone to falling apart—while the train was in motion. When steel cars began to replace the wooden ones, the job of delivering mail became safer. 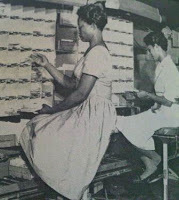 The Railway Mail Association, a labor union which excluded blacks, began to recruit white workers to displace blacks from the postal work. In 1913, a group of African Americans formed a union of their own to protect their jobs and give blacks a voice with the postal authorities. 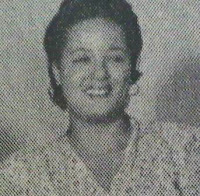 Against all odds, this black union survived. By 1921, it had made enough progress that a bureaucrat in the post office assured the the president of the union that the union members would be “treated white”. The president replied that he would prefer that his members just “be treated right”. Hence the title “Treat us right, not white”, a fascinating history of this union—the National Alliance of Postal and Federal Employees (NAPFE)—written by my friend Paul Nehru Tennassee, the noted historian, political scientist and labor leader. The book is available here. The union will mark its 100th anniversary in 2013 at the foot of Lookout Mountain, Tennessee, where it was founded. The union’s historian, Paul Nehru Tennassee, has a colorful history of his own which I hope will be told some day.